We are starting sweet corn harvest on Father's Day (June 19). If you plan to come out to the farm to pick up corn, please call ahead for availability. We are delivering corn and othe veggies to locations in Bristow, Tulsa, Edmond, and Shawnee. To order for delivery, please register on one of our online markets. You can also drop by and get corn at Brookside Farmers' Market in Tulsa on Wednesday mornings. Come early! We often sell out long before noon. We are growing all non-gmo sweet corn this year and do not spray with insecticides. To help control corn ear worms, we are releasing Trichogramma wasps and green lacewings as natural biological controls. They will not totally eliminate catepillar damage, but we hope that they will reduce it. * Thank you for supporting natural food production! *Note: after one week of corn harvest we are finding that our first two patches have widespready corn earworm damage. 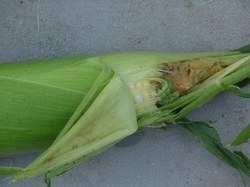 Most ears will have some worm damage towards the tip and a few have damage on the sides of the cobs. We will try to toss the ones with major side damage out or give them as freebies. The above picture was taken at one of our backyard corn roasts last summer. That is LAST summer's corn. That particular ear was from the genetically modified patch. We are not growing GMO corn this year and have very few ears that are that clean. The following picture (compliments of Purdue Horticulture Dept.) is more representive of this year's crop. Natural sweet corn with some corn ear worm damage in the tip.